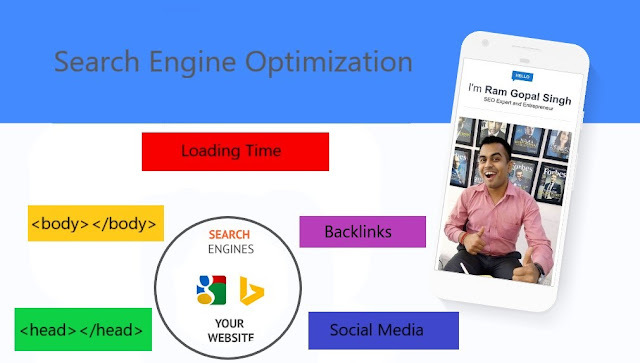 Full form or meaning of SEO is 'Search Engine Optimization' that is a part of Digital Marketing. The actual meaning is that it is a process where you optimize your website according to the search engine terms and conditions. So that your website can appear at the top of the search engine on user's queries. Search Engine: Search engine is basically a website where you can search answers to your queries. It suggests weblinks related to the query and this way you can find your answer on visiting them. There are two types of SEO. First is Onsite/On-Page SEO and second is Offsite/Off-Page SEO. In onpage SEO, we optimize the programming code (like title, meta tags, microdata/schema), focus on server & page speed, and make content users friendly. Offpage SEO basically based on the 'Backlinks Building'. In this steps, we create references from related websites and make the website more familiar with search engine bot. How can You start Onsite optimisation with your website? There is three main part of onsite optimisation. You can start with these elements. <head></head>: This element act as a container for metadata (data about data) and is placed between the <html> tag and the <body> tag. Here we can write about <title>, <meta>, <script>, <link> and <base> tags. Metadata typically define the document title, character set, styles, links, scripts, and other meta information. Metadata is not displayed. Read more We optimize it one by one according to our business and keywords/phrase. <body></body>: The <body> element is displayed. It contains all the contents of an HTML document, such as text, images, hyperlinks, tables, lists, etc. Some tags are very important like <h></h> <ol><li><ul><span> etc. It help us to optimize text/content. ALT attribute within in the IMG tag helps us to optimize Images. How can You start Offsite optimisation with your website? Backlinks: In this method, you do link building that acts as a reference for users. Many ways you can build backlinks, for example, Blogging, vlog, Infographics, etc. Social Media: Nowadays, Social media famous among peoples. Facebook, Google plus, Instagram, Reddit, Pinterest, Linkedin, and more social sites have millions of users register on them. You can find eyeballs for your business to create huge traffic on your website. Black Hat SEO and White Hat SEO. These are the technical weapon to increase website rank. But some experts have divided it into two part. BlackHat SEO: Blackhat SEO means 'Using Bad Technique' or you can say, These techniques break the rules of search engines. In my point of view, you can apply these techniques. But it depends on Internet users. If your users happy with your website's terms & promotions on the internet and they have no objections then all things are right. SEO - It's a game which is played with Artificial Intelligence. 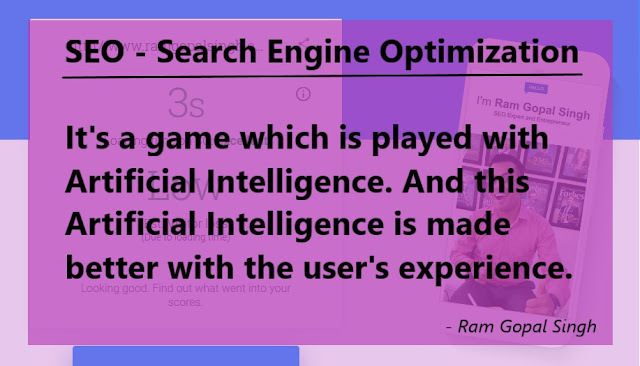 And this Artificial Intelligence is made better with the user's experience. Quality Guidelines of Google Search Engine. Quality Guidelines of Bing Search Engine. Quality Guidelines of Yandex Search Engine.